Got Ears?® Fat Tips™ In-Ear Isolation Earphone Replacement Tips fit virtually all in-ear style earphones or earbuds that have replaceable tips and stems that are 4-5 mm in diameter. Got Ears?® Fat Tips™ are the perfect alternative to over-priced replacement tips sold by the manufacturers. Available in small, medium, and large sizes. 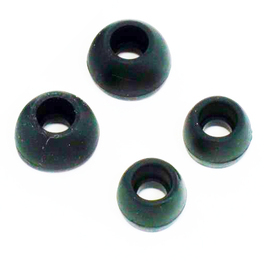 Got Ears?® Fat Tips™ are well made to fit your earphones and your ears. These great little tips can be easily removed so you can clean them with mild soap and water, and the medical grade silicone used to make them is hypo-allergenic. Fits all in-ear style earphones with 4-5 mm diameter stems. Three sizes to fit virtually all users from kids through adults. Two colors. You cannot see them in your ears, so who needs 25 different colors? Medical grade silicone for durability and hypo-allergenic safety. Economical packs of 5 pairs! Washable with ordinary soap and water for maximum hygiene. Got Ears? Fat Tips In-Ear Isolation Earphone Replacement Tips (Pack of 5 Pairs)5Richard BSeptember 26, 2014They arrived promptly, fit my earbuds perfectly, and are very comfortable. I like them better than the original ones. Got Ears? Fat Tips In-Ear Isolation Earphone Replacement Tips (Pack of 5 Pairs)5MikeNovember 4, 2012Plugs fit great and are the color that matches my earbuds. Got Ears? Fat Tips In-Ear Isolation Earphone Replacement Tips (Pack of 5 Pairs)4michael wojtowiczOctober 26, 2012It was so easy and straight forward to get exactly what i wanted.